A collection of episodes with videos, codes, and exercises for learning the basics of the R programming language through examples. 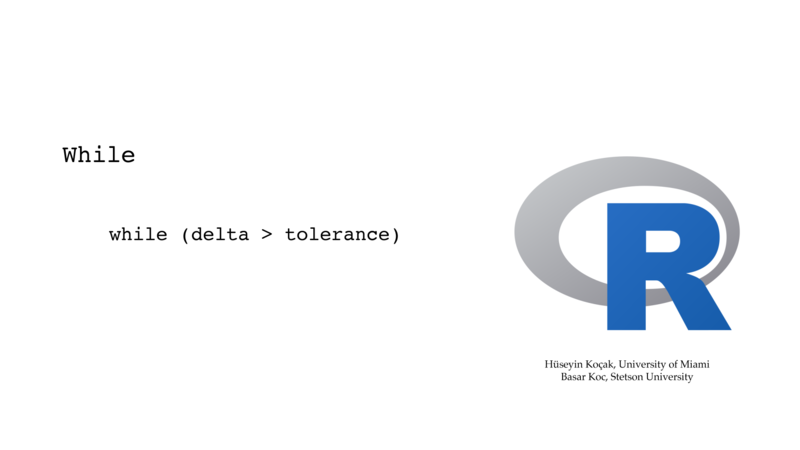 # R displays 7 digits by default. You can display more digits with options(). # is evaluated first and the result is assigned to the variable on the left. # Variable names must start with a letter and can have letters, digits, underscore, and period. # : operator has higher predecence than the arithmetical operations. Multiplication table: Write an R code that prints out the 9x9 multiplication table. For this problem, you need to create a variable that holds the sequence of integers from 1 to 9. By multiplying this sequence repeatedly with appropriate numbers, you can print out the multiplication table. Vectors: Write an R code that prints out the odd numbers from 1 to 13. Use the R function sum() to compute the sum of these odd numbers. Use the R function mean() to compute the mean of these odd numbers. You should use the R function cat() to get a nice output. Random numbers: Random numbers with desired distributions (e.g. uniform or normal) are important in statistical data analysis. Look up the descriptions of R functions runif(), rnorm(), mean(), and sd() using the help facilities of R.
The R function runif(10, min=0, max=1) generates 10 random numbers uniformly distributed between 0 and 1. Generate 1000 random numbers uniformly distributed between 0 and 3 and save them in a vector. Compute the mean of these numbers. Is the computed value of the mean acceptable? 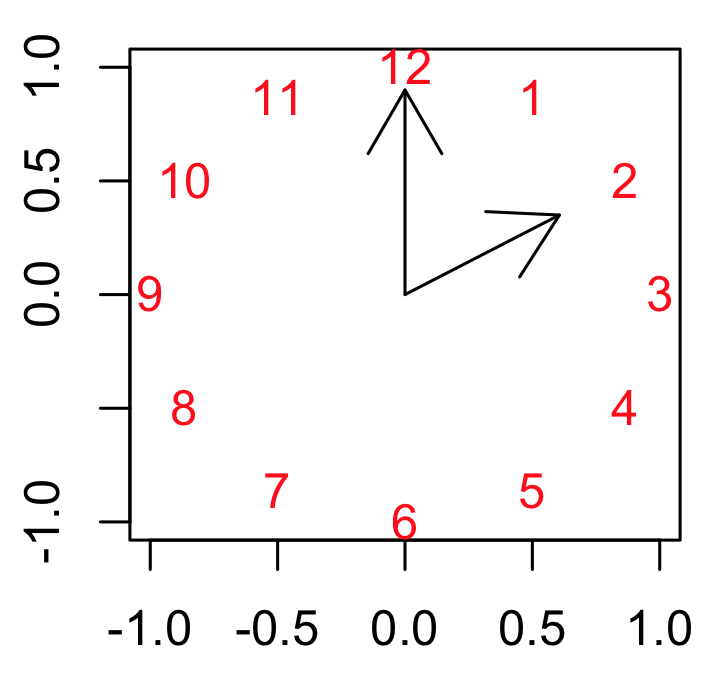 The R function rnorm(10, mean=0,sd=1) generates 10 random numbers with mean = 0 and standard deviation = 1. Generate 1000 random numbers with mean = 150, sd = 9 and save them in a vector. Compute the mean and the standard deviation of these numbers. Are the computed values of these two numbers acceptable? # With the par() command can set the multi plot environment. # the plots are then drawn in columns. # the plots are then drawn in rows. Plot the temps as a function of time. Is the temp leveling off? Why? Reset the clock: Copy the R code below and run (source) it. Modify the R file so that the clock shows 3:30. Include a picture of your new clock and the source file. For this task, look up in the R manual how arrows() function works, and also how to output your picture to a file format (pdf, png, ...) of your choice. Extra credit: Can you set the clock to any prescribed time XY:WZ (hour:minute)? E(Θ , Θ') = (1/2)m(L^2)(Θ'^2) + mgL(1- cos(Θ)). This Energy function is supposed to be conserved along the solutions of the pendulum. Show this assertion by computing dE/dt using the chain rule, keeping in mind that Θ and Θ' depend on t, and the differential equations for pendulum. Observe that dE/dt = 0, so it must be constant function of t.
Free energy from EULER: Now, in the pendulum equation, take c= 0, m=1.3, l=1.25, g=1, the initial conditions Θ=0.6 and Θ'=0 and compute the solution for 20 time units using Euler's algorithm with step size of h=0.2. On the Time Panel of Phaser's Numerics Editor set "Skip iterations per plot" to 9 so that in the Xi Values view you will get the solution tabulated at even integer values of time: you should have 11 rows of numbers. Now, with R, use these position and velocity numbers in the formula for the Energy of the pendulum above so that you will have 11 values of the Energy function. Plot these Energy values as a function of time. Are these Energy values constant? Increasing? Decreasing? Free energy from Runga-Kutta(4)? Repeat the problem above using Runga-Kutta(4), leaving all the other settings the same. Are the energy values constant? Increasing? Decreasing? # This code asks the user to enter a number. # otherwise, it exits with a message. # while loop iterates a block of statements as long as a condition (boolean) remains true. Multiplication table: Write an R code that prints out the 9x9 multiplication table. For this problem, you need to use two for statements, one inside the other. Separate the entries on a line of the table with tabs. 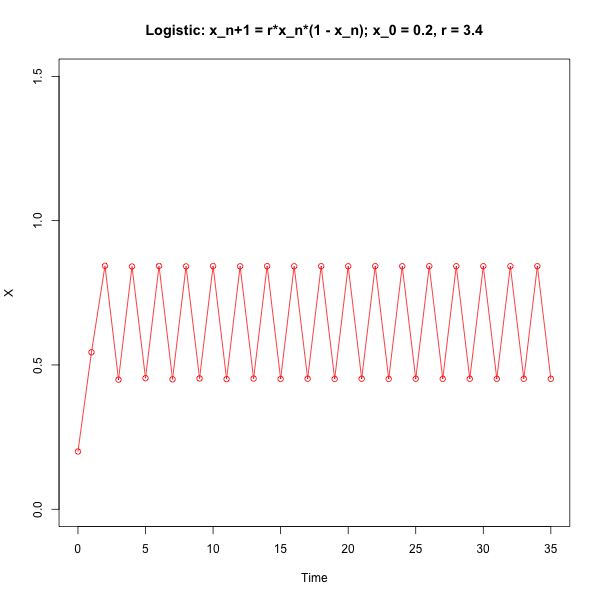 Logistic XivsTime plot: Please write an R code to recreate the picture below. Use a for loop to iterate with the logistic map with the indicated initial condition and parameter. In plotting, make sure to get the initial point right. 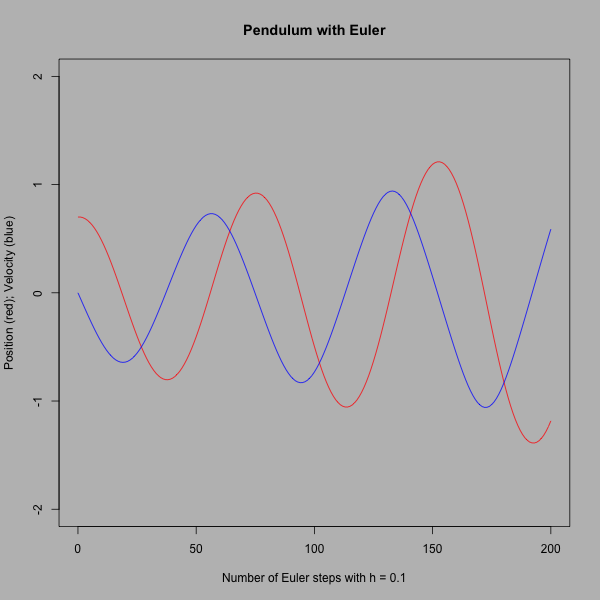 Computing with Euler: Write an R code that computes the solution of the frictionless planar pendulum with Euler's algorithm. Take step_size = 0.1, number_of_steps = 200. Set the parameters in the pendulum as g = 1, L = 1.3, initial_position = 0.7, initial_velocity = 0.0. Plot the position and the angular velocity of the pendulum vs. time, as shown in the figure below. Note: after you plot the position variable with plot(...), you can add the velocity using points(...) function of R. You might look at some of the sample R codes below. Chaotic Logistic map as a pseudo random number generator: In the early days of search for pseudo random number generators, the chaotic dynamics of the Logistic map xn+1 = r * xn * (1.0 - xn) for the parameter value r = 4.0 was one of the candidates at Los Alamos. 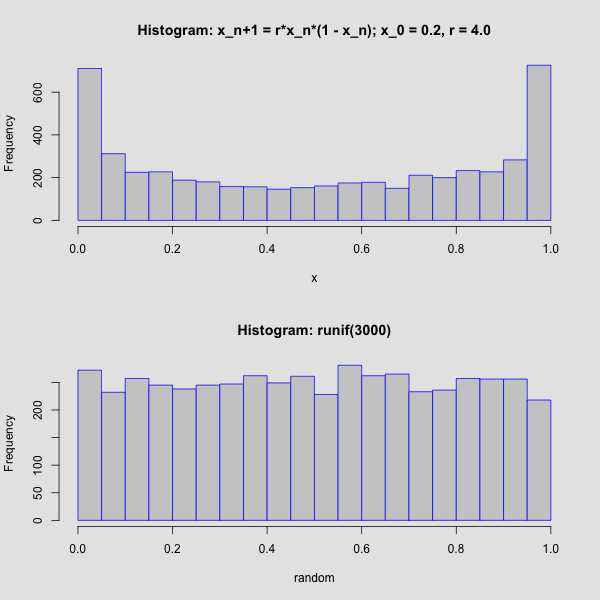 The picture below shows a comparison of the histograms of the 3000 iterates of the initial value x0 = 0.2 under the Logistic map, and the pseudo random number generator of the R function runif(3000). Read about what a histogram is. Consult R help for information, and the options, about runif() and hist() functions. Write an R script to reconstruct the picture above. Here, the number of bins is set to 20 by using the breaks = 20 option in hist(). Experiment with increasing the number of iterates and the number of bins. Argue for or against using the chaotic Logistic map as a pseudo random number generator. # After sourcing this file, the functions herein will be loaded into memory. # sin of 0.5 for 5 terms. 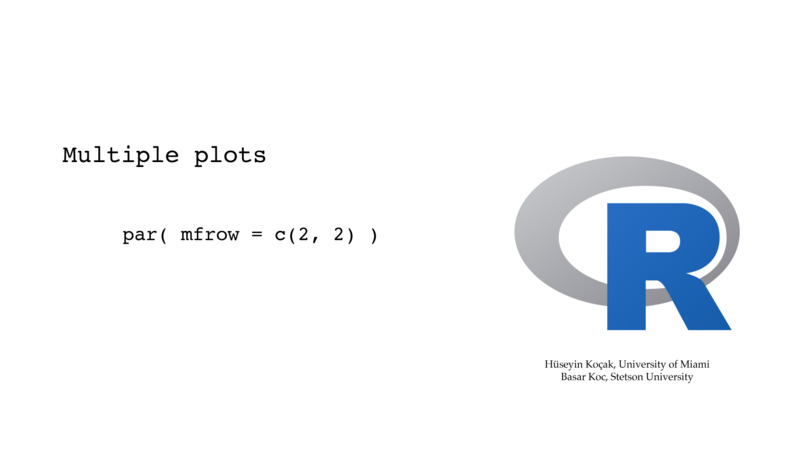 to compute the square root of any positive number A.
Ricker Model: The R code below computes and plots the discrete population model of Ricker for three parameter values. Modify this code to add to the plot a forth one for the parameter value r = 3.5. # This script is from R for Beginners, by E. Paradis. # for three values of parameter r.
# y as a function of x. Type ?formula for help with legal formulas. # lm() can also be used to fit nonlinear models where the parameters enter into model linearly. # in a laboratory are counted daily for 15 days. # estimate the values of the parameters a and b. # Compute  15  points, ((y[t+h] - y[t])/y[t], y[t]) and determine the best fit line. # Intercept = a and slope = b. 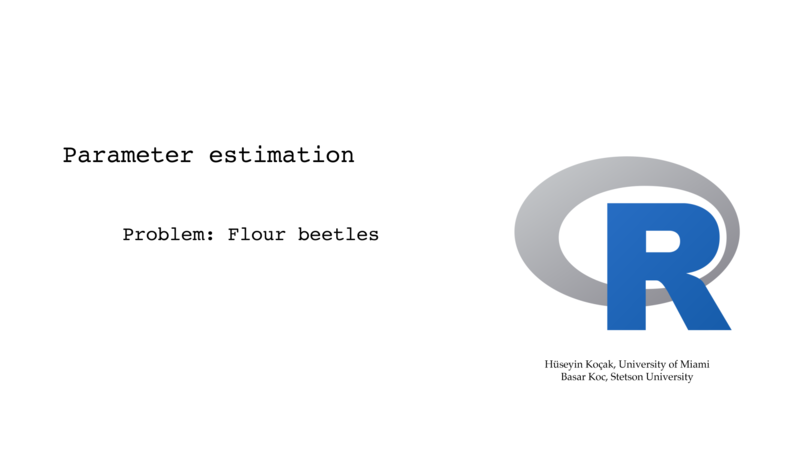 Error vs. step size in Euler: We showed in class that the global error bound in Euler's algorithm is proportional to the step size. Now, in PHASER solve the initial-value problem x' = x, x(0) = 1 to compute x(1) = e = 2.7182818284590452354, using Euler's algorithm with seven different step sizes. Using R, plot the errors against the step sizes. Next, use the lm function of R to determine the "best-fit line" to the data points. What is the proportionality constant of errors vs. step size? (-1, 1.1), (0, 2.05), (1.8, -0.5). Find the unique parabola y = a + bx + cx^2 passing through these three points. Beetle model: Download the R file beetle_parameters.R from the Beetle episode and run (source) it. Read out the parameter values of a and b for the logistic differential equation y' = ay + by^2. Now, use these parameter values in the Cubic1D ODE differential equation in Phaser, with the appropriate initial condition, and print out the Xi values for 14 days. Now write an R code that computes the averages of the data points and Phaser points and prints out the difference between the two averages. Plot the numerical approximation of the derivative from the data vs. the temperature. Notice that this graph looks almost linear. Now compute the least squares fit line to this graph and determine the equation of the line. What is the differential equation and the initial condition governing this experiment? Put this differential equation into Phaser and plot the solution. Does the Phaser plot resemble the experimental data? This is the official Web site for R. You can download R for your computing platform. Copyright 2018, Hüseyin Koçak, University of Miami and Basar Koc, Stetson University.